An article from David Leigh about the wonders of the winter calçotadas in Valls. If you stop for a moment and think about food and Spain I bet you get no further than paella and tapas. However, while both of these can be good the quality, particularly of paella, can be quite variable as many of those served in fixed menu restaurants at lunchtime are pre-made. And Spanish cooking doesn’t start and end with just those. In Barcelona these days you can find cuisine from all over the world. However, if you’re just visiting for a weekend or a few days then why eat what you can get at home when you can try something new. One of my favourite times of the year in Catalonia, at least as far as food goes, is winter. While temperatures can really plunge, which takes many visitors by surprise, the food can make up for it. Boiled chicken with vegetables and chickpeas might not sound particularly interesting but it certainly warms you up in winter and makes a great tasting soup base when there is snow on the ground. Good as it is, its something you’ll find in the Catalan home rather than in a restaurant and so unlikely to be on the menu anyway. No, what I’m really thinking of is the “calçotada”, a speciality of Valls that has found popularity throughout Catalonia and particularly celebrated during the last weekend of January. 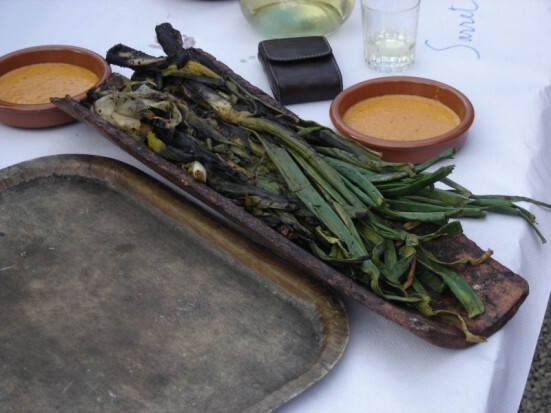 The calçotada is a feast which has as its starter specially grown spring onions – calçots – which are chargrilled and served in one of the curved earthenware roof tiles that are so common is Catalonia. They are eaten by stripping off the outer skin and dipping them in a special sauce. Pa amb tomàquet, which is toast smeared with overripe tomato, salt and olive oil, is served to accompany the calçots and mop up any left over sauce. After the calçots comes a selection of grilled meats, which vary. Most commonly you’ll find lamb and botifara, a type of spiced pork sausage found all over Catalonia, but chicken, beef and rabbit are also common. While calçots are eaten all over Catalonia and in Barcelona (I recommend Restaurant Carmen, c/ Valladolid, 44, near Sants mainline railway station, which I’ve been going to for some 12 or 13 years), visiting Valls during the annual calçotada is a must do for anyone interested in food. 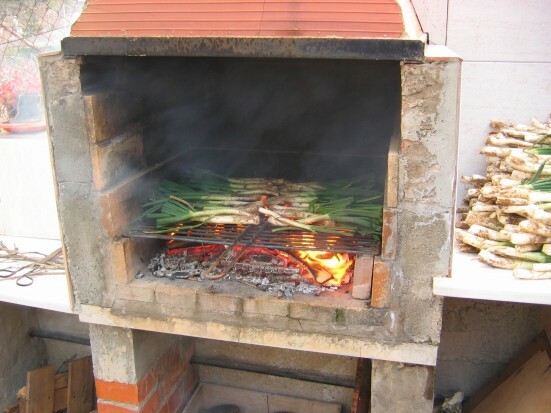 During the weekend the whole town is given over to calçots and you can smell them being cooked from several kilometres. In the town itself you’ll find demonstrations of how to make the sauce, an explanation of how they are grown (planted, uprooted, stored over winter in the dark, replanted and covered with a “boot” of soil so they don’t get too much sunlight) and vendors selling calçot related products such as a liqueur made from the onions. In the squares they have fires going with great piles of calçots and for a few euros you can buy 12 calçots with pa amb tomàquet and wine. But one of the highlights is the calçot eating competition. Numerous men (and I’ve never seen a female participant) are given piles of the onions and whoever eats the most in an hour wins. I know someone personally who took part and managed 100 calçots, but the real champions can eat many more! While such a festival may seem strange seen through British or American eyes, it makes a great day out and the calçots are delicious and warming. And if you’re in Barcelona for a day or so during the season I definitely recommend you find a restaurant that advertises “calçots” or “calçotada” and give them a try for yourself. David Leigh has lived in Catalonia for more than a decade, first in Barcelona and now in the forests of la Selva. When not enjoying the food he runs a website specialising in providing FC Barcelona tickets to visitors to Barcelona. I missed the calçotda this year, but I’m looking forward to it next year. 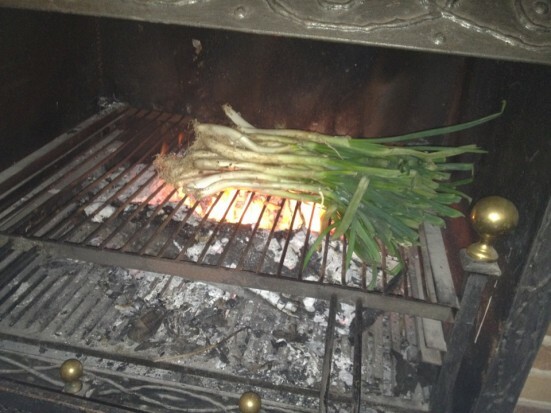 Calçots are such a delicious food. I can’t imagine eating 100 though! Hi David. I’ve just come across your post about the ‘calçotada’ and I think it’s brilliant. I am actually from Valls, and last year, together with two mates, we started a project about everything related to ‘calçots’, although specifically focused at first on those restaurants working on it. This year, our project has gone one step forward, we have actually translate it from Catalan into Spanish and English, and since we’re seeking the web for more info to help us spread this extraordinary piece of culture and cusine, we’d like to quote you as well as publishing your post on our Facebook page. Is that ok with you? If you want to check out our website, here it is (we hope you like it!). Hi Artur, thanks for your comment. David wrote this post for me. You’re welcome to publish this on your Facebook page as long as you link back to this page. If you’d like to contact David you can via his website listed in the bio at the bottom of the post.